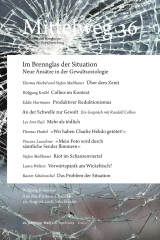 Publication of Mittelweg 36, the bimonthly journal of the Hamburg Institute for Social Research, began in 1992. The journal offers its readers an opportunity to trace the progress and results of ongoing research projects at the Institute. The periodical also documents and initiates debates related to the issues investigated at the Institute with a focus on critique of current affairs and cultural developments. And in keeping with the Institutes use of tools and forms of representation that transcend the traditional repertoire of social science research to employ images, exhibitions, and texts of various genres, the journal also incorporates these various forms of expression into its pages. Each issue of Mittelweg 36 also includes, as a further regular feature, a selected incident from the Protest Chronicle, in which Wolfgang Kraushaar documents the history of social resistance movements in the Federal Republic of Germany. The journal has succeeded in winning and maintaining the interest not only of a quite specific academic community, but also of a broader spectrum of interested readers. Mittelweg 36 continues to attract attention in the public arena and has become a recognized forum for debates on issues addressed by the social sciences. The table of contents and a selected article from the most recent issue as well as a complete listing of all issues published to date can be found on the web at www.hamburger-edition.de/zeitschrift-mittelweg-36 .